On the obverse of the 14k gold medal here offered is a soldier in a 0.5” x 1” oval, with 13 gold stars at the ovals circumference. Atop the oval is an eagle with wings down. On the reverse, in a similarly sized oval, is a bust of General George Washington in high relief with “Sons of the Revolution” in arc above the portrait and “1883” below it. Engraved on the verso of the eagle is the mint which produced this medal “BB&B./Phila” (Bailey Banks & Biddle Philadelphia) and the serial number “4554." On the verso of the 13 stars are “Alfred Lawrence Aiken” at the left and “Jan 27 1930” at the right. 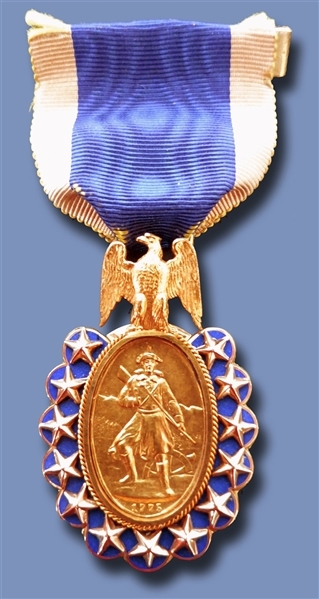 The medal is suspended by a 1.5” x 1.25” gold-blue-gold ribbon and clasp. The scarce presentation case is 2” x 4.5” x .1”. Alfred Lawrence Aiken (1870-1946), prominent Boston banker, a Governor of the Federal Reserve Bank of Boston (1914-1917) and a longtime admirer of Alexander Hamilton, aide-de-camp to Gen. George Washington and his first Secretary of the Treasurer.